Srinagar, Jul 19: Despite cloudy weather, more than 17000 yatris today left Baltal and Nunwan Pahalagam base camps for holy Amarnath cave shrine in south Kashmir, where more than 4.5 lakh yatris had darshan of the self made ice-Shivlingam since the commencement of the 46-day-long pilgrimage from June 29. The yatra will conclude on August 13 when the Chhari-Mubarak, Holy Mace of Lord Shiva, will be taken to holy cave by Mahant Deepender Giri, the custodian of the Charri on Rakshabandan. A yatra official said that pilgrimage was progressing smoothly though the ski was cloudy since this morning. There were reports of light rains at some places on both shortest Baltal and traditional Pahalgam tracks. 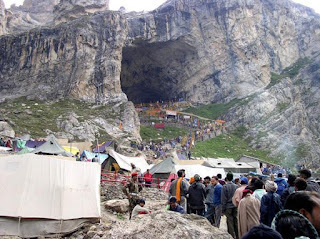 About 10000 pilgrims, including women, children and sadhus today left Baltal base camp to cover the hilly track on foot to reach the holy cave, situated at 13500 feet above sea level. He said the pilgrims are expected to reach the holy cave this afternoon and after a night stay, will start return journey tomorrow morning. Over 7000 pilgrims also left Nunwan Pahalgam base camp for last motorable halting station, Chandanwari. However, the pilgrims who had night halt at different halting stations on this traditional also started their onward journey towards the cave shrine early this morning. More than 4.5 lakh pilgrims from all over the country had darshan of the ice-Shivlingam, which has now been reduced to only few feet because of unprecedented rush of pilgrims this time. Against agree 10000 pilgrims from both sides, more than 25000 pilgrims are visiting the shrine daily, majority of unregistered. Official sources said majority of the pilgrims who visited the shrine have since returned to their homes.